In this Struts 2 tutorial, we will learn to get JSON response using Annotation. In the previous tutorial you have seen we get the JSON response using struts.xml but if you are using Annotation, you do not need to create the struts.xml file. To get the JSON response, you must have these JAR in your build path. Note: To get the JSON response you must need to set "json-default" as parent package and result type is json. Using annotation set the package as json-default to support the JSON. 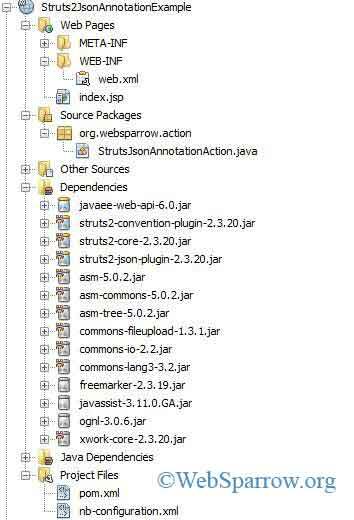 Define the struts 2 filters in web.xml and pass the action class by defining actionPackages. In this class data converted into JSON format. To run the application start your server and hit this URL in address bar localhost:8090/Struts2JsonAnnotationExample/india.action. 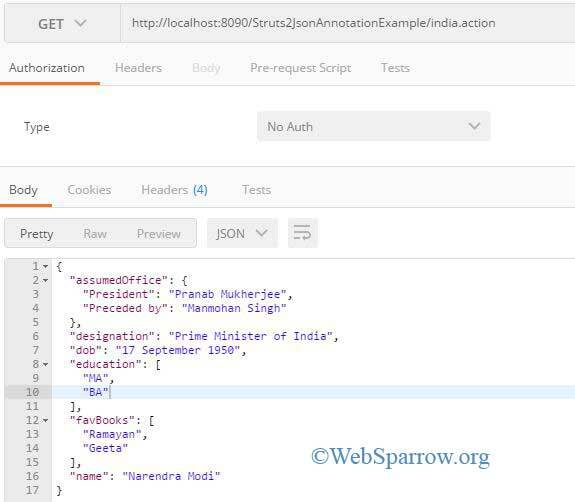 To get the JSON data in arranged form use the Chrome Postman.